Glenorie sits an hour or so’s drive from Sydney, in the rural northwestern region that seems to have escaped rampant suburbanisation and remains a haven for people who prefer a slower pace of life, wide open fields, and properties large enough to raise horses on. Amidst the small clusters of villages that exist to support this lifestyle sits the shopping region of Glenorie, with a supermarket and a handful of small stores selling scented soaps, hand made rag dolls, and antiques. And amongst these is the Glenorie Bakery, which seems to be a modern building but constructed in the style of a century old woolshed. 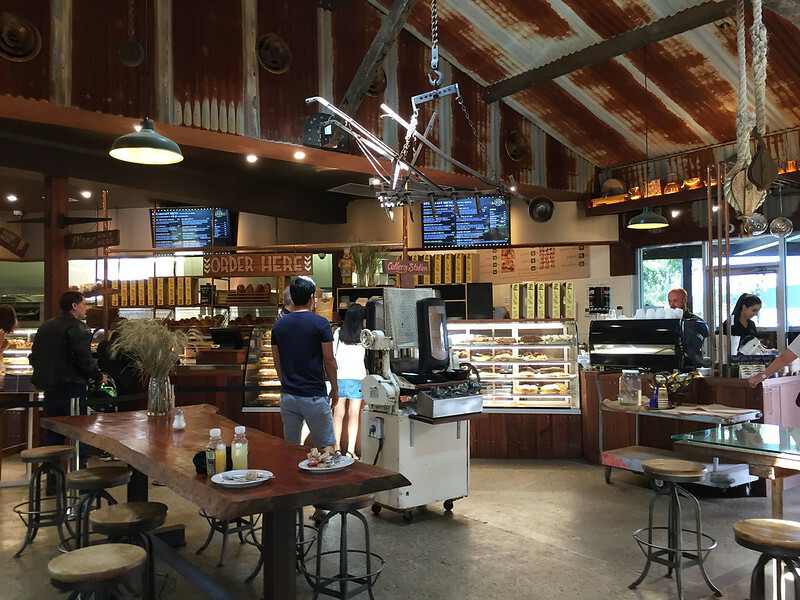 Walking inside reveals an expansive interior space, filled with all manner of antique farming, baking, and retail equipment. The decor is “1900s farmhouse”, and rust appears to be the decorating material of choice. There’s an old… plough or something hanging from the ceiling, wooden wagon wheels reclining against the walls, and sheafs of wheat decorating large rustic wooden shelves containing enough knick-knacks to stock a large antique shop or rural museum. There are some large dough mixing machines which look like they were retired some time before the Second World War. It’s certainly an interesting space. And also attracting the eye are several modern glass counters full of all manner of delicious looking baked delights. There’s also a solid wooden table nearby containing wicker baskets lined with checked cloth and brimming with loaves, bread rolls, croissants, and similar bready things. And there’s a large pie warming display chock with pies and sausage rolls. The range looks extensive, with things such as butter chicken pies. But it’s only morning tea time, so I settle for a sausage roll and a vanilla slice. When I ask for the slice, the lady behind the counter asks if I want a regular one, or a passionfruit one. I take another look at the display and say I only see regular looking ones there. She takes a look from behind the counter and say, “Oh! The passionfruits have sold out!” I take the sausage roll and “regular” vanilla slice on the provided plates to a table which is oddly covered with a slab of glass, which seems out of place in this decor. The place has several other customers, both inside and on the large shady verandah outside. Clearly it’s popular and likely enjoys a good reputation among the locals. 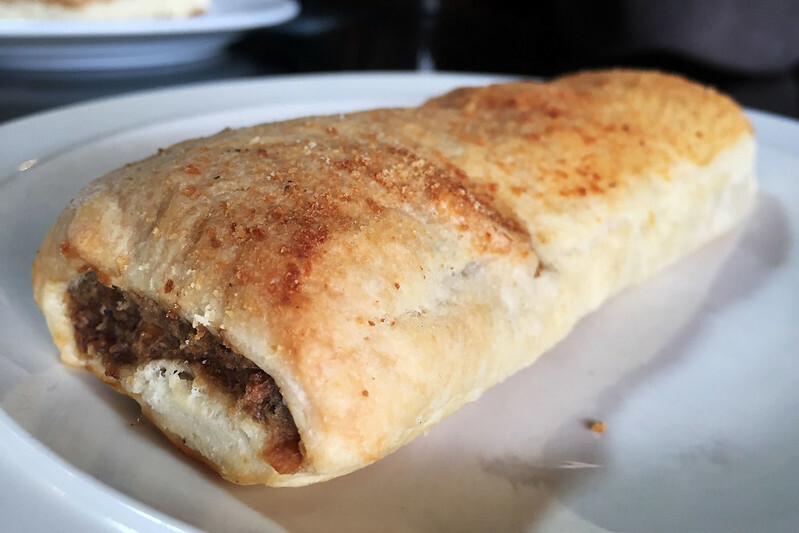 Examining my purchases, my first impression is that the sausage roll is rather flat and uninspiring looking. 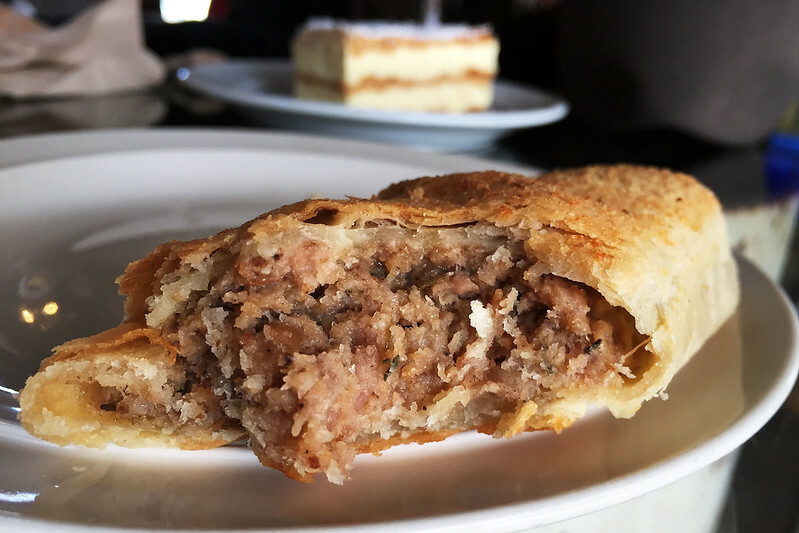 It has a thin, biscuity-appearing pastry, which is dusted with breadcrumbs that are baked to a golden crisp. The meat showing at the ends looks a bit grey and burnt crispy. Visually, this is not off to a great start. Picking it up and starting with a bite on one end, the pastry turns out to be exactly as flat and lifeless as it looks, with no crispiness, and no flakiness. It really does nothing but provide a handhold for the meat. Speaking of which, the meat appears to be beef from the dark reddish colour and the flavour, but it has a texture that betrays some cereal filler; it feels a bit like there are couscous grains mixed through it. It has a decent savoury flavour, with some flecks of black pepper, but no herbs or onions. The result is a rather one dimensional flavour profile, with basic salt and pepper seasoning but nothing much of interest to sustain it. It’s moist enough to be a painless chew and swallow, but not juicy like properly cooked meat. Overall, it’s not actively offensive, but neither is it really good in any way. Moving on to the vanilla slice, I see that it comes resting on an individual sheet of gold coloured cake maker’s cardboard, like if you were buying a whole cake. The custard at the bottom looks oozy and melty in a few spots. This is an unusual appearance, and it’s not clear what’s happened, because the custard doesn’t look particularly like it should melt. Perhaps it’s condensation from the refrigerated display? The architecture of the slice is three layers of rich brown pastry sheets which show visual flaking into shale-like layers, sandwiching two layers of pale yellow custard. The top is coated with a thick dusting of white icing sugar. On picking up the slice to eat by hand, a few things happen. 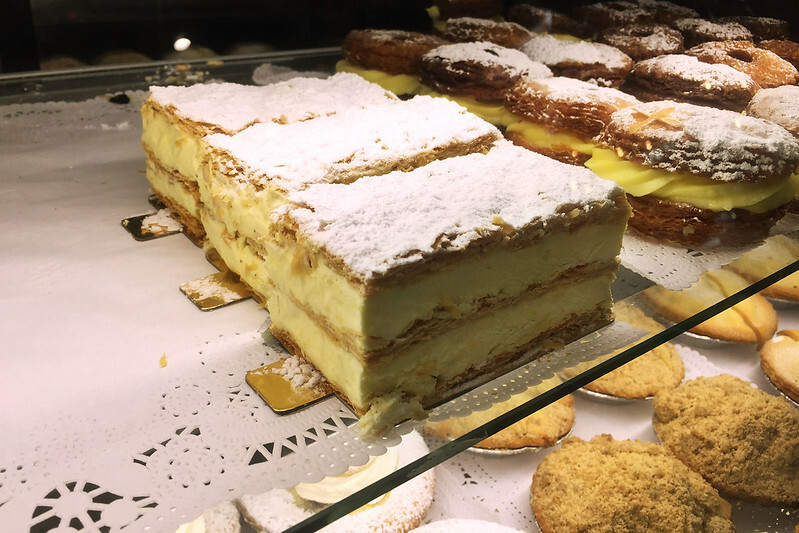 It separates into two along a fracture line in the middle pastry layer, part of the bottom pastry layer is left sticking to the golden card, and half of the icing sugar on top slides off onto the plate. I’m not mourning the loss of the icing sugar, as I always find that there’s a serious danger of inhaling powdered sugar and coughing on it, which makes it my least favourite slice topping. 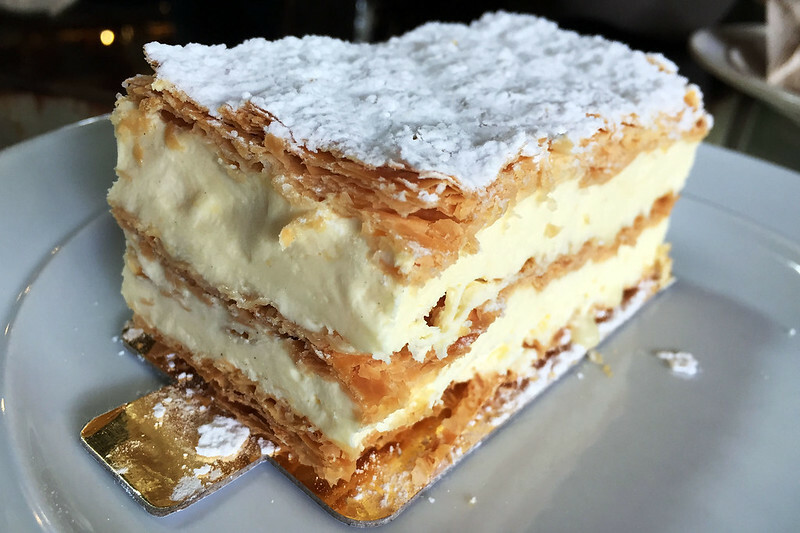 I try manfully to devour the slice, but it’s messy to eat as the firm pastry sheets squeeze the very soft custard everywhere – it oozes and drips off onto the plate in several large blobs. The custard is very light and creamy, almost like a stiff whipped cream rather than a true custard. 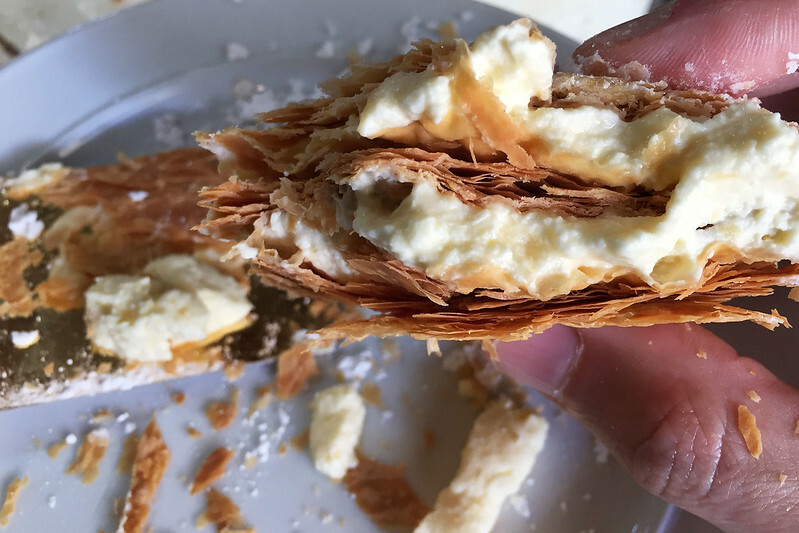 It has a nice flavour though, sweet and with a decent hit of vanilla, and is nicely set off by the crunch and flake of the pastry. The pastry is really pretty good, and I can find no faults with it, but the custard could definitely be firmer and denser, with more of a custard texture. In summary, this is pretty good, and I’ll definitely have to come back to sample the passionfruit variety another time.